My itty bitt blog is three today. Well, it was Saturday, but it's close enough. How is that even possible? Where did the time go? Wasn't it just yesterday when I was sitting at my desk at 1am trying to get things in my sidebar to line up straight? Me.The girl who had no knowledge of sidebars, coding, clickable links, copyright laws, feeds, commenting etiquette or linky parties...nothing in this mysterious world of blogging I had so blindly entered. It didn't seem to stop me. I may have been naive, but I was on a mission. I just wanted to write. I wanted to share my thoughts, my crafts, my ideas, my silly stories, my words, with the world. Whether they were read or not, I needed to create and put them out there. So I did. On March 5, 2013, after weeks of working behind the scenes, I wrote my first post, hit publish and held my breath. Well, not much of anything. A few friends read my post and called or emailed me to say it was great, but they didn't know anything about blogging either. They didn't have profiles, couldn't figure out following or commenting. It was kind of quiet here at Exquisitely Unremarkable. Slowly, however, I figured out blogging. Well, as much as one can ever figure out blogging. The traffic grew and so did the feedback. The techie people told me there was a lot of red on my site. I really should lighten things up if I wanted to grow. Ditch the tulips, they're boring...and that's not a logo. Others told me that people wouldn't get my sarcasm, my humor, my tongue in cheek approach to decor dilemmas. "You either need to be a home decor blogger or a humor blogger. Or you need to do serious. People need to know in the first three seconds they're on your site, what you are, or they'll leave." Of course, these were also the people who were telling me to be authentic. In the end, I thanked everyone for their perspective and then just kept doing what I wanted to do. After all, this is my little home on the internet and hadn't I always preached that you need to create a space you love and not worry about those that don't live there? "Fill it with things bring your pleasure, things that hold meaning for you." Besides, wasn't I the girl who wrote what other people think of you is none of your business? Today, I am glad I listened to my gut, I am very proud of what I've created. I've stayed to true to me and my voice. I have mixed serious and sarcasm, crafts and embarrassing tales. Have I changed my mind about some things along the way? Yes. Live and learn I guess, but overall, I have followed my vision and spoken from the heart. One of the greatest compliments I have received was from a neighbor who told me,"When I read your stuff, it's like you're right there in my kitchen, telling me the story. I can hear your voice, your intonation and see your hand movements." Italian. Lots of hand movements. But that type of reaction has always been my goal. I just wanted to share with friends...inspire...provoke thought...make people laugh, just like we were chatting across the table. Do I have the most views on the web? Ha! Hardly, I am a teeny, tiny baby blogger. If I had a day job, I would not be quitting it. However, I have never published a piece I wasn't in love with. 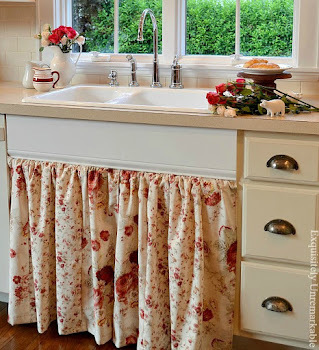 I have made some wonderful friends with whom I have actual relationships and I have inspired people to try some of my projects, like a reader who actually made my box pleat valance, and another who made my Cheatloaf Meatloaf. They really made them!! I can't tell you what that means to me. In addition, readers talk to one another via the comments, have shared recipes and tips with me and opened their hearts regarding some tough subject matter too many times to count. It was recently pointed out to me, that beyond a blog where I speak at people, I have created a community. I was floored by that observation. It's more than I ever could've imagined and I am so grateful that you have chosen to be a part of it. My husband jokes around with me and calls it my KIMmunity. Ha ha. He thinks he's funny, but this time, I told him to joke all he wants. I like it! And I'm going to use it. It may be my anniversary, but I am offering you a chance to take home the present! I want to thank you all for being part of my journey, for reading, sharing, commenting and following. It means the world to me, truly, so I'm giving away this bag! I found it at Barnes and Noble and it just screamed spring to me...plus it's covered in tulips. My favorite. Kind of meant to be, don't you think? It's perfect as an overnight or carry on bag, a day at the beach or park or if you like a big purse, it could totally work. and this fabulous pink printed lining! 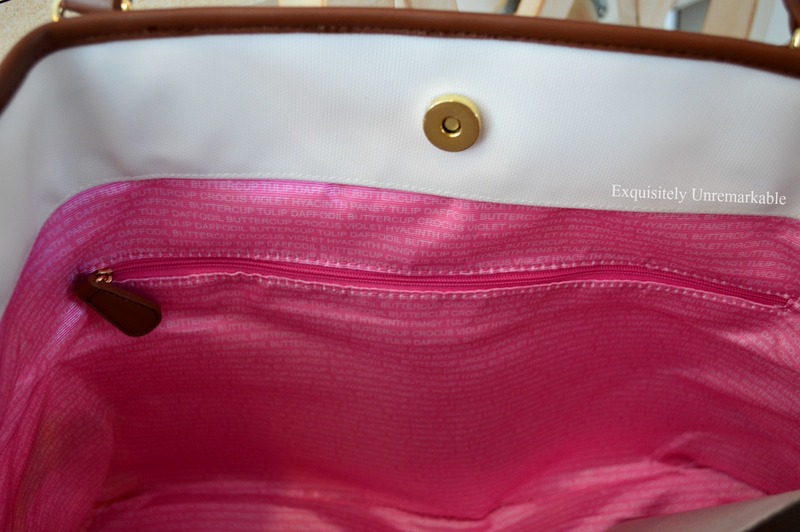 There is a zippered pocket on one side and a snap closure. Of course, I wish I could give one away to everyone, but with college tuition on the horizon, I've just this one. If you'd like a chance to take this lovely lady home with you, just leave me a comment saying so! That's it...BUT... (there's always a but)...if you are not a blogger or you are no-reply, please, please, please leave me your email, so I can get in touch with you if you win! AND...(yup, there's an and too!) if you are an email subscriber let me know that and you will earn a second entry just for following along that way!! Not an email subscriber, no problem. Join the KIMmunity (sorry, I couldn't resist!) 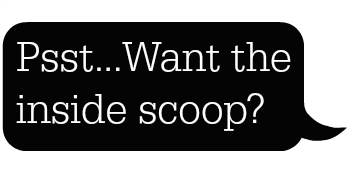 ~ Sign up in the sidebar and earn yourself another entry! Can't figure out how to comment here? Then leave me a comment on Facebook!! That counts, too! I will announce the winner on Tuesday, March 15th. *While I would love to be able extend this giveaway to all, due to shipping costs, it is only open to residents of the continental United States. I still love the rest of you just as much though and in the near future I hope to offer a giveaway just for you. Pinky promise! Until then, I will be staring at this bag and endlessly reminding my husband that my birthday is coming up soon and it really would make a lovely present. Well, first of all, congratulations on your blog anniversary. It's an awful lot of fun isn't it? A chance to grow your interests and expand your community across oceans and continents....no borders! The bag is beautiful, and if you are opening the draw beyond borders, then I would like to enter.....and I subscribe by email! OK, so I'm new at this and totally techy clueless but, first, I really love your blog and, second, I'm a sucker for a 'win this' in any genre so here I am. Posting. As instructed. Go me! Thanks for the giveaway and Happy Anniversary!! Congratulations Kim on your anniversary. You have very much to be proud of in your writing here. I am so glad to call you a friend. i'm proud to be part of your kimunitiy! LOLOL! we started about the same time then. and i'm with you... it's a perfect creative outlet! i am a subscriber. i knew immediately that i wouldn't want to miss any of your posts. Kim, I've just adored your blog from day 1. Be authentic? I'm thinking you are! You've blogged about tissue boxes, and meatloaf, and kid spaces...that's all real stuff in my book. Congratulations on your blog anniversary. I am one of your email subscriber and I have been enjoying your blog for sometime. That is a cute bag. Congratulations Kim on your three years of blogging! I would have sworn you have been blogging for much longer. Your blog is so professional but also homey. Kim, I'm really glad you didn't listen to the techies and ditch the tulips because that has become your brand along with the red of course. Always stay true to yourself, we love you just the way you are. Happy Blogging! Congrats on your 3rd bloggiversary. Being true to yourself makes for a super blog in my humble opinion. That is one lovely bag. My bday is the first day of spring, the 20th. It would be neat if I happened to be the winner. Whoever wins will enjoy this though. It definitely says spring. I also am an email subscriber. I click your link often from Cozy Little House's sidebar, this is a great giveaway, what a pretty bag! Congratulations on your blogging anniversary! Congratulations on your 3 year anniversary! Keep being true to yourself and writing about what you love. We love following you!!! Love the bag and love the blog! I'm a subscriber. Thanks and keep it up! Congratulation son you blog anniversary! Your posts and beautiful pics are always such a joyful way to begin my day. Love, love, love the tulip bag!!! Loved your Tulip bag giveaway . . . Happy three year Anniversary . . . Excellent post Kim! It is why I "read you" . . . You Are Authentic . . . I loved the KIMunity, I think it is the best way for me to communicate to a non blogger of why/what Irish Garden House is all about. It is my place in my community . . . I like your DIY ideas, I like your tulips, red and white and I really, really like your personal, profoundly written pieces . . . I am happy we are living in the same community . . . I wasn't surprised when I learned you had been elected mayor . . .
How exciting that you are celebrating such a nifty event in your life. Your blog is a favorite of mine and I always feel so welcome, happy and like we just had a great visit! This bag is wonderful, wonderful and how sweet of you to offer it to your readers! Thank you for his great opportunity! Happy 3 Years!!! I have been following you via email since I fell in love with your pleated chair and YES I would love a bag like that for Spring. I agree with your neighbor that it is like chatting with a girlfriend, to read your posts. And I love all the red! So glad you stayed true to yourself. Happy Birthday! So enjoy your blog! I appreciate your openness and for telling it like it is. Makes it so easy to relate to. Congrats on your 3rd birthday! Your Spring bag is so bright and cheerful. Please sign me up for the giveaway. Thanks again for putting some sunshine into my day! Congrats on your anniversary! I just recently found your blog and love it. That bag is awesome. I am also an email subscriber. Love your blog...congratulations on your anniversary. Have been following you for a few months and really enjoy it. Also would like to start a blog, so you have inspired me ! LOVE the bag....It would be perfect for me to carry my books to and from my job as a school librarian....have an old black one with the handles fraying ( too many books !!!??? no such thing!!!) and this one would be perfect. Thank you for the chance ! Keep on blogging ! Happy Anniversary! You really do write such interesting, entertaining, fun and thought-provoking posts, Kim! I think we are all very fortunate to know you and benefit from your wisdom, frankness and humor. You are so sweet to give away this adorable tote. As much as I would love to win, you have already gifted me with so much.....your friendship, encouraging words, and lovely coverings for my little noggin (their beauty is much better displayed around my neck...lol). I hope this will be a wonderful week for you! Happy Anniversary! Love reading your blog! Thanks for the giveaway opportunity. 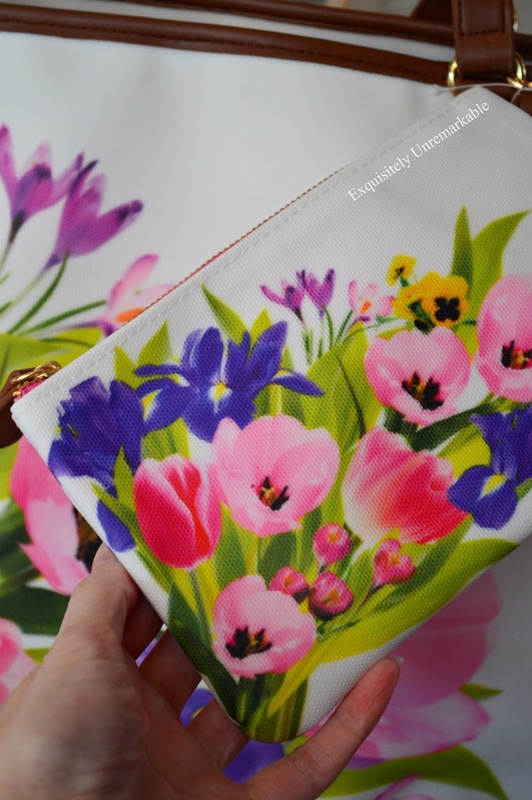 It is a beautiful bag and yes it does scream spring. I am an email subscriber. Happy 3rd Anniversary Kim!! I totally get your humor and reading your blog makes me SMILE! That tote bag is absolutely gorgeous and I would be over-the-moon thrilled to win! Thanks for the opportunity. I love you and your blog the way it is KIM! You are as authentic as anyone can be, and hence the honors you've received and the loyal friends you've made! CHEERS dear! And thank you for that wonderful giveaway, for a bagaholic like me, I can NEVER HAVE TOO MANY LOVELY BAGS!!!!!! Happy 3rd Blogging Anniversary Kim! It's has been great to follow you along your journey and I love the red. I am a red girl myself and can't get enough of it. Hi Kim. 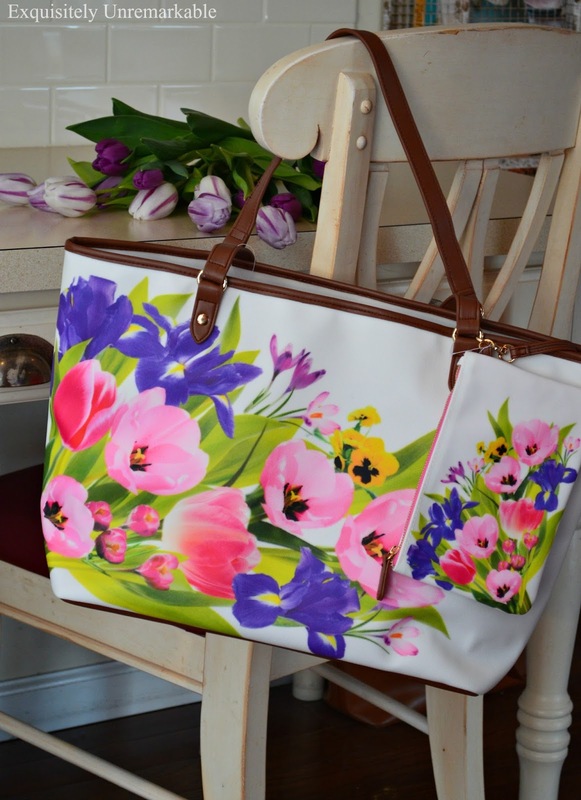 The tulip tote caught my eye on the BNOTP link up so I thought I's check you out. Congratulations on your three years of blogging. I've been at it for five years in an on again, off again way. I love your tagline, recognizing uncommon beauty in the everyday. That's my kind of thinking! Congratulations on your anniversary!! It's a gorgeous bag and would be a wonderful addition for anyone. Thanks for the opportunity. I'm new to your blog, by a few weeks, and enjoy it here. Congrats on your anniversary! I love reading blogs and getting to know new people. Congratulations on three years - the time flies by doesn't it! It's amazing to me that you've only been blogging for three years. I mean, I knew that, but you've done a great job. Much better than most in that short of a time. As far as the people that told you how to run your blog... Opinions are like butts (nice version ;) ) everyone has one. Most though, have no idea what they're talking about. You keep being you. After all it's why we became friends and why so many people other come here to see what you're up to. Happy 3rd Blogaversary, my sweet friend. Congrats on your anniversary, sweet friend - and you know I'm totally aboard the "Kim-munity" - ha ha, your hubby is a funny one, too! Of course I had to go back and read your first post....love it, you're too awesome! I'm so glad you didn't ditch the red....or the tulips....or listen to anyone but your heart. Hugs! I like the Kim-munity. Better file a Trademark on it before the "K-family" hears about it. Sign me up for the sweepstakes too. I'm not an email follower but a Bloglovin' follower, hope that counts. You have a gift of writing from the heart and I love that! Happy anniversary to your blog. I love that bag. You are so sweet to offer it as a giveaway. Thanks for the chance to win. Congratulations on your blog! I am not a no responder or do I ever win anything ,but just in case mcsawyerj2@att.net. Congrats on your 3 year anniversary my friend! Keeping true to who you are is what makes EU so awesome and I know that you must be so proud of everything you've accomplished here. Hugs to you! What a wonderful giveaway! The bag is just so pretty! Thank you for such a kind opportunity! I am glad that you kept your blog authentically you. People blog for so many different reasons and I have always thought that you blog simply because you enjoy it. Happy 3rd Anniversary on your Blog, Kim! Tell your husband that his play on the Kim-munity really works and that I am glad to be a part of the Kim-munity! Looking forward to many more years of your blog. Thanks for the opportunity to win that gorgeous bag; I love the flowers! I am a subscriber to your blog, so I never miss a post. continued good wishes to you! Congratulations on 3 years! The bag just screams Spring! Hi Kim, Congrats on your 3 year anniversary of blogging. What an inspiration you have been. I have loved your blog right from the first time I visited. I, of course have also followed you by email from my first visit too. What a beautiful spring bag. I would love to enter your generous giveaway. Keep doing things your way. You're the best and much success on many more fun filled years of blogging. A very happy birthday to your wonderful blog Kim! I myself believe that being authentic to who you are is the way to go. Congratulations on your blog anniversary! You've created such a happy place here, I always enjoy my visits. Congratulations on your blog anniversary. I received the same kind of advice about being one way or another, and like you- I did what I wanted. I am so glad you did too! It's about the words isn't it? Hi Kim, thanks for telling me about your giveaway.....a beautiful spring bag that is beautiful! I have also spoken to you by e-mail. I just want you to know that I loved your story about starting your blog, because I started mine about the same time, and by the end of the year, I had given up! Too much work, and there were things I just couldn't figure out! So I have alot of respect for you for NOT giving up and look what you have today, one of my favorite blogs and I read each post from email. I love your ideas and the fact that you share all your genius ideas with us. It was your box pleat chair skirt that attracted me to your blog the very first time, and I've enamoured every since then. Thanks, Kim for the opportunity for this lovely giveaway, congratulations on your 3 year anniversary, and keep your blog going, it is indeed inspiring! Hello Kim, Wow happy Blogiversary to 3 years of blogging! I love everything about you and your lovely blog. You are such an inspiration and I love your easy recipes and crafts. What a lovely giveaway and yes that bag does scream Spring! Wishing you many more years of blogging. I love reading every post you do, you really have a gift with writing! Thank you for the chance to win such a great give-a-way! Hi Kim Congradulations on your anniversary! I'm glad you decided to stick to it and do things your way. I enjoy your posts and friendship. Three years - that means you're a success and I congratulate you! The bag is gorgeous! It would look so nice, indeed, hanging on my shoulder! I'd love to win it! Thanks for being so generous. Congratulations! I subscribe and found you I think through another blogger (not sure which one) but blogs were kind of new to me and now I'm hooked! It's like chatting with a friend and flipping through a magazine for ideas all rolled into one!!! That bag is adorable and yes it does scream spring. Keep up the good work we like you we REALLY like you. Congratulations on your third anniversary Kim! You have a lovely blog and I always enjoy my visits here! Beautiful bag, Kim! I owe you two congratulations, one because on your blog anniversary and two, because you are the winner of my Spring giveaway. Congratulations! Please email me and provide me with an address where I can send your gifts. Thank you again for your support and friendship all year long. You can email me at: mariaelenahm@aol.com. Congratulations on your blogaversary! Three years is a great milestone. I enjoy your blog as well as you! What a lovely bag! Happy Blogaversary, Kim! Mine 3 year is coming up soon and I had almost a year of receiving hardly any comments ;) Lovely giveaway! Happy Bloggyversary!!! I love being part of the Kimmunity!! !